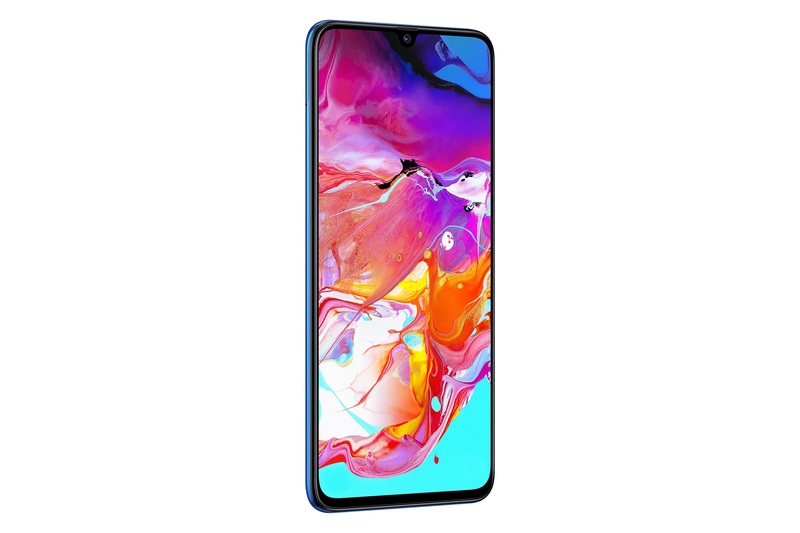 Samsung India today announced Galaxy A70, its sixth smartphone in the popular Galaxy A line. Galaxy A70 is a powerful device that has been designed for the fast-paced lives of digital natives. It allows them to share their experiences and stay connected longer. Galaxy A70 comes with a host of disruptive features, including a 32MP triple rear camera that is capable of shooting stunning super slow-mo videos. Galaxy A70 has a massive 4500mAh battery with 25W super-fast charging capability to give the young consumers the freedom and convenience to share, stream and play all day long. Galaxy A70 is also equipped with Samsung Pay which enables consumers to carry their wallet on their phone and pay almost everywhere securely. Keeping in mind the need of the shutter-bugs, the new Galaxy A70 features an impressive 32MP triple rear camera capable of shooting stunning super slow-mo and ultra-wide videos. It has a 32 MP low-light lens with f/1.7 allowing Gen Z and young millennials to take brilliant pictures in any lighting condition. The 8MP Ultra-wide lens has a field of view of 123 degree which enables users to capture both ultra-wide images and videos. The 5 MP depth lens allows users to capture impressive portrait shots and the Live Focus feature enables adjusting the depth of field before and after taking a shot. Galaxy A70 also features Samsung’s intelligent Scene Optimizer which analyses a scene across 20 modes and adjusts the colour, contrast and brightness to instantly optimize image quality. For Selfie buffs, there is a 32MP front camera that allows them to express and connect in fun ways using features like AR-Emoji and Selfie-Focus. To provide great entertainment experience, Galaxy A70 comes with a premium 6.7” FHD+ Infinity-U display and Widevine L1 Certification for streaming of true HD content. Samsung’s proprietary Super AMOLED technology brings the display alive and allows streaming of vivid and crisp videos. Galaxy A70 is also equipped with Dolby Atmos to provide a 360 degree surround sound experience. Galaxy A70 is equipped with company’s proprietary Samsung Pay which allows consumers to carry their wallets on their phones. With military grade security Knox, consumers can pay securely almost everywhere. “At Samsung, it’s our endeavour to deliver new experiences to our consumers. We are witnessing a change from an era of static to an era of live and Galaxy A70 is built for this era of live which allows them to capture experiences, connect and share it with the world in real time. With its best in class display, revolutionary Samsung Pay, path breaking triple rear camera and top notch processor, the newly launched Galaxy A70 is all about experience. I am sure our consumers will be delighted with this ultimate powerhouse,” Ranjivjit Singh added. With its impressive camera capability, immersive display and revolutionary Samsung Pay, Galaxy A70 is sure to appeal to the traveller, binge-watcher and shopaholic. To keep up with their fast paced lives, Galaxy A70 comes with an Octa-core Qualcomm Snapdragon 675 processor which can handle the most demanding of tasks with great ease. Coupled with a 6GB RAM, Galaxy A70 provides a smooth and seamless multitasking experience. It also features Samsung One UI interface on top of Android Pie, making it comfortable even for one-handed use. The powerful 4500mAh battery can easily last up-to two days and if one runs out of charge, Galaxy A70 comes with 25W Super-Fast Charging technology and USB Type- C port to let the users stay connected all day long. Galaxy A70 will be priced at INR 28,990 and available for pre-book between April 20 and April 30. Consumers who pre-book can purchase Samsung U Flex, a premium Bluetooth device worth INR 3,799 for INR 999 only. 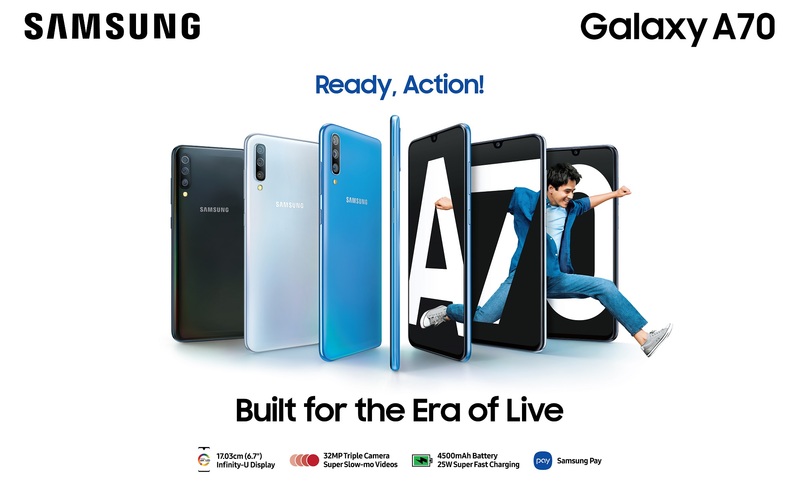 Starting May 1, Galaxy A70 will be available for sale in three beautiful colours- White, Blue and Black across all retail stores, Samsung e-Shop and Samsung Opera House. Galaxy A70 will also be available on Flipkart.